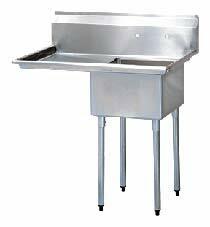 NSF approved Stainless Steel Sink, 38.5-inches Overall length. Measurement diagram for AERO Stainless Steel Sink with right drainboard (available left or right). 18" x 18" x 12" compartment size. 18 gauge, 304 series stainless steel bowl with galvanized gussets and tubular legs with adjustable ABS feet. Made in the U.S.A.
the legs belonging to the sink were full of spots that even after spending a lot of time sanding them carefully down they looked bad. I had to paint them. So that part was not too good.